I have a big statement silver ring with a flower motif. Every time I put it on, it cheers me up instantly, because it's like having a bit of summer on the finger of my hand! Given that it's late November and snowing outside as I write this, the idea of wearing something that's a reminder of sunnier and warmer times is very appealing. If you like this idea as well, then a flower ring could be just what the doctor ordered! 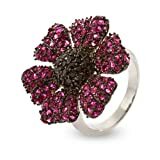 I've had a look on Amazon.com and have found some fabulous flower rings; have a look at the capsules further down the page to see whether they fit the bill. Any of them would also make a brilliant gift, maybe for Christmas or Valentine's Day? I've concentrated mainly on sterling silver, because it's affordable yet collectable, and suits most women. This is probably what most people think of when they think of flower rings - a "cluster" of stones set in a flower shape! The magenta and black CZ (cubic zirconia) cocktail ring by Eve's Addiction (right) is a magnificent example of this type of ring. The flower head is nearly an inch in diameter, so this will really make a statement, and would look fabulous with a simple party dress. No need for any other rings - this will do the job all by itself! Or if you prefer plain black (with a white CZ centre), then try the black onyx flower ring, also by Eve's Addiction. Another ring that will make a statement is Leah Hanna's sterling silver blue heart ring, which is also shown in the main picture. 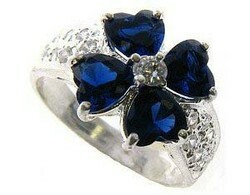 The flower on this is made from CZ stones in a gorgeous dark inky blue, with white CZ stones down the side of the shank. This one is wintry rather than summery perhaps, but in a very good way! At the time of writing, all these three rings are also available in other sizes. Another way to represent flowers on a ring is to have the flowers carved into the stone setting. This type of design is often found in Southwestern-style pieces, like the Carolyn Pollack carved blue turquoise ring shown here. The actual carving is taken from the design of a tooled leather saddle! Or for a romantic option, try a ring in rhodonite or pink mother of pearl. Perhaps you'd prefer a ring where the flower design is in the metal itself, rather than in the form of a stone setting. JKL's sterling silver filigree flower ring is a great example of this type of ring, as is Naked Fashion Jewelry's silver cluster ring (not what I would describe as a cluster ring, but a great design nonetheless!). Or you could go for Silver Insanity's hammered silver ring, with a delicate herbal flower design etched on a hammered background. This one's adjustable, being designed to fit size 8 and a couple of sizes up. However, smaller sizes are also available. Band measures 13mm wide and tapers to 6.5mm on the palm side. Protected with an anti-tarnish plating. Extra wide with a hammered finish, this handmade ring is etched with a leafy herbal sprig and is adjustable in back. Handcrafted of sterling silver and marked 925. What is Sterling silver vs silver? Silver plated vs sterling silver? Fine silver vs sterling silver? What to get for your loved ones? Silver jewelry is beautiful and affordable, and it never goes out of fashion. Most silver jewelry is made with sterling silver, but what is sterling silver?